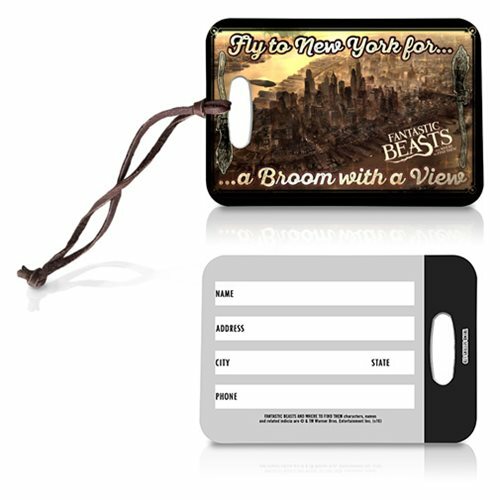 Bring a piece of J.K. Rowling's Wizarding World wherever you go with this Fantastic Beasts Broom with a View Luggage Tag. Made of fiberglass reinforced plastic with a UV resistant surface for increased durability, it measures 4-inches wide x 2 3/4-inches tall and can be used as a luggage tag, keychain, or zipper pull, depending on how you choose to show off your fandom. The artwork features 1920s New York City as it appears in the film and the words "Fly to New York for… a Broom with a View." The reverse side is for your name, address, and phone number.